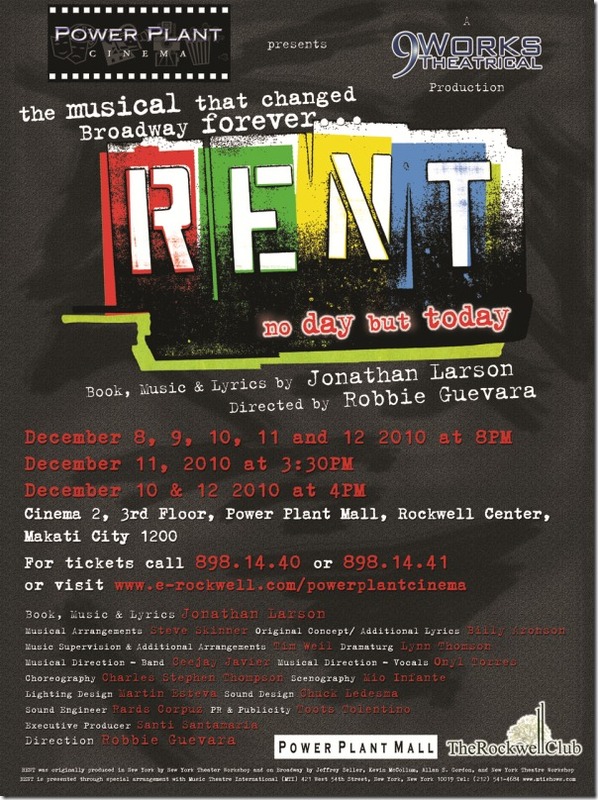 Power Plant Cinema celebrates its 10th Anniversary with RENT, a Pulitzer Prize and Tony Award winning revolutionary rock musical being presented in a limited run at Cinema 2 from December 8-12, 2010. Produced by Power Plant Cinema and 9 Works Theatrical, RENT is directed by Robbie Guevara. With book and lyrics written by Jonathan Larson, RENT is an imaginative retelling of the classic Giacomo Puccini opera, “La Boheme” set in the gritty Lower East Village of New York City. RENT is the unforgettable and timeless story of a group of starving bohemian artists. Despite poverty and illness, they all learned to struggle with love and life, and survived during the rise of a mysterious, deadly disease known as AIDS. Eventually, all of them found their voices and brought a universal message of hope for everyone. This is a timely presentation since the world just celebrated World Aids Day on December 1, 2010. Some of the country’s talented theater artists who will reprise their roles for this specific production of RENT (as previously staged by 9 Works Theatrical last February 2010) include singer/TV host Gian Magdangal as Roger Davis, the songwriter. Gian recently starred in the successful musical hit “The Wedding Singer," also by 9 Works Theaterical. Also featured are Fredison Lo as Mark Cohen, the nerdy filmmaker; OJ Mariano as Tom Collins, the computer genius; Job Bautista as Angel Dummott Schunard, Collins' drag queen street musician lover; and Jenny Villegas as Joanne Jefferson, Maureen's public interest lawyer lover. The rest of the ensemble is composed of Gary Junsay, Harold Cruz, Johann de la Fuente, Mark Tayag and Peachy Atilano. New members of the cast have joined this limited run of RENT led by noted theater actor Lorenz Martinez who gives a new twist to the character of Benjamin Coffin III, a former member of the group who, after marrying a wealthy woman, has since become their landlord and the antagonist in the play. Fresh from a stint with Universal Studios Singapore, Amparo Sietereales, alternates for the role of Mimi, Roger’s lover / bar girl – a role she originated during a previous production of RENT in Manila several years back. Sheree Bautista, TV personality/singer and Gian Magdangal’s real-life wife plays the role of Mimi. Newcomer Mian Dimacali bravely plays the role of Maureen Johnson. Sab Jose and Pam Imperial join as part of the ensemble. The artistic team of RENT is led by Robbie Guevara, director; Ricky Villante, musical director (band); Onyl Torres, musical director (vocals); Mio Infante, scenographer; Martin Esteva, Lighting Designer; Chuck Ledesma, sound designer; Bek Soriano, costume stylist; and Francis Matheu for additional choreography. The RENT production team is composed of the following: Santi Santamaria, executive producer; Anna Santamaria, company manager; Toff de Venecia, Marketing & PR Director and Production Manager; Paul Domine, Technical Director; Arma Bonilla, stage manager; Toots Tolentino, PR Consultant; Jonjon Martin, PR Manager; Shelyn Tayanes, Marketing Manager; Campaigns & Grey, PR Agency. RENT will be staged for a limited run of 8 performances at Power Plant Cinema 2 from December 8, 9, 10, 11, 12 (8PM), December 10 (330PM), 11 (4PM) & 12 (430PM). Get your tickets now at the Power Plant Cinema ticket booth. Call (632) 898-1440 or 898 1441 or +63-908-8692988.